Our spring Artists in Residence will be collaborators Sarah Atlee and randall barnes who will create a body of work called Embrace. They will work at Current Studio during the month of April and their exhibition will open in May 2017. We cannot wait to see what they make together, using Classen Ten Penn Neighborhood, #embracethebuff, and the inherently empathetic medium of quilting as inspiration. In the Classen Ten Penn neighborhood in Oklahoma City, like many neighborhoods, a back-and-forth exchange is happening between graffiti writers and the workers who "buff" the graffiti by painting it over, creating a fresh space for the cycle to continue. Artists Sarah Atlee and Randall Barnes are taking this cycle as inspiration for a new body of collaborative work. 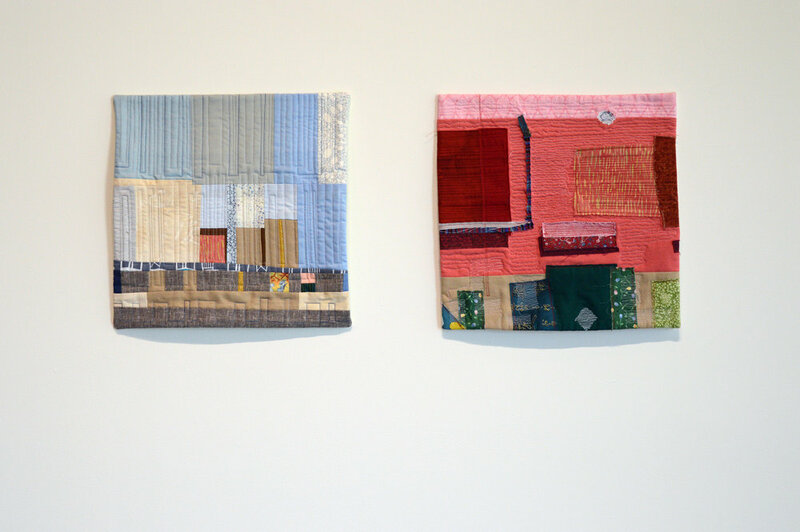 Using photographs taken in the Classen Ten Penn neighborhood and fabric from nearby thrift stores, the artists are creating quilts based on images of walls where graffiti has been "buffed." Through this process they examine a divisive phenomenon and transform the evidence into objects signifying connection and inclusion. Cold, hard walls become warm, soft quilts. The artists invite neighbors to participate in this dialogue. What do they think about graffiti? What does the buff mean to them? How does it affect their views of the neighborhood? These conversations will influence the artists as they work.